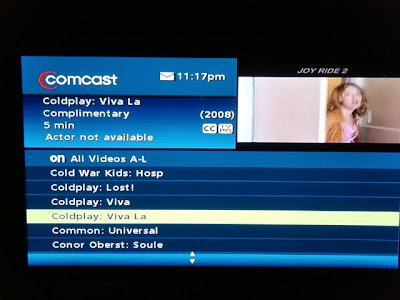 Comcast provides bonus music video content and concert footage through their 'On-Demand' channel but the 'Music' section is difficult to navigate and lacks flexibility. From the 'Music' link, there are 20 options including 'All Videos A-L' and 'MTV2' with all sorts of submenus but, without a breadcrumb, navigation is unclear. Once I found a video I liked (by Interpol), I couldn't remember how I found it. After a video was done playing, I was immediately brought back to the previous menu but at the beginning of the alphabetical video list. I expected to be brought back to my previous location in the list to watch more videos by the same artist. I also wanted to be able to select multiple videos rather than selecting only one a time. This inflexibility causes frustration; breadcrumbs and multiple selection would make 'On-Demand' a better music user experience. For the past several months, I've been working with the CHIRP Radio volunteer tech team to design a mobile solution that allows station DJs to plan out their weekly shows. At a high level, a DJ should be able to browse and select songs from a massive music library, and add them to one or more playlists, which can be used for their shows. The app also has functionality like the ability to read album reviews, view recent activity by DJs in the app, and review a DJ's profile. A site map is an important artifact when designing any application or website. It shows how the overall navigation should be structured, can be used with end users to validate the taxonomy, and is helpful for developers as a companion to wireframes or mockups. A few weeks ago, my wife and I really wanted to see Alvvays and Frankie Rose at Metro in Chicago. But the show sold out and I was left to look for tickets second-hand. I've used Stubhub before to purchase concert tickets but up until now, hadn't tried their Price Alert feature which lets you set a ticket price max and be notified when the price goes below it. The user experience from beginning to end was really good. The feature is easy to find and provides very mobile-friendly controls to create the alert. The Price Alert tab was prominent on the event details screen - very easy to find. Note: today (1/5/18), Stubhub has removed those tabs and you have to tap an Info button top right of the viewport to look for the same feature. It's a still a good UX once you get there but it's an additional step. A couple of weeks ago, I wanted to buy an inexpensive stand for my acoustic guitar. I was already familiar with Reverb, which is an online marketplace to buy and sell music gear. Without knowing much at all about guitar stands, I did a search, landed on their site, and within several minutes I was able to research and purchase a new stand. From the helpful information about different stands to the last step of the checkout process, the user experience was great. I am a UX designer and researcher, interested in how people interact with digital music. Email me for more information. What's driving the Mini's audio system?